The discal spot (broader, more prominent) was the main feature that persuaded me. 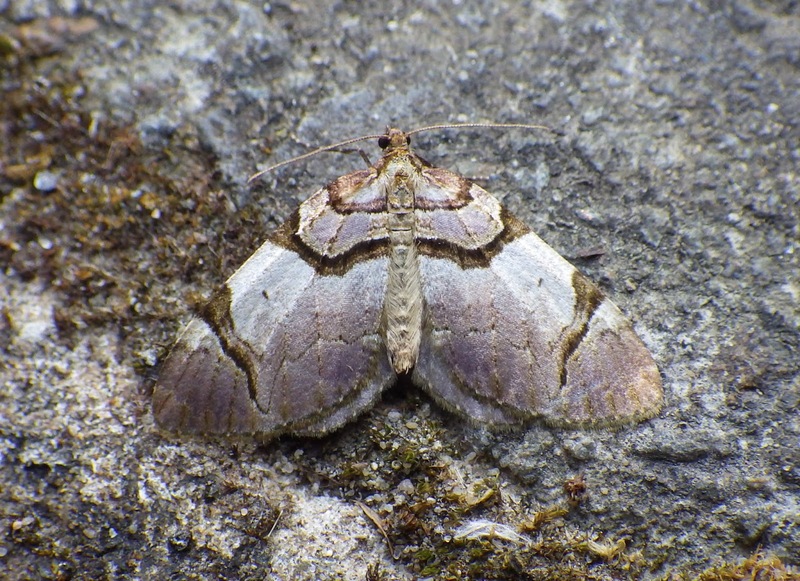 I had the right-hand one down as a Double-striped Pug at first, but this species doesn't have a discal spot (does it?) and usually sports a prominent 'nose'. If so, I believe that it's a first for me. As at least a few of us have found, it`s still worth trapping as the warmth counteracts the clear nights, resulting many species being on the wing. I did n`t trap last night but the previous night (19/4) brought me 18+ species, including some FFYs. 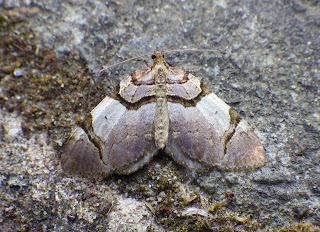 A Dyseriocrania (= Eriocrania) subpurpurella was a first for me, a tiny but beautiful moth that is associated with oaks. Left-click to enlarge the imperfect and blurry photo. Above: resplendent in its `gold with iridescent purple spots attire` - D. subpurpurella. The "garden" at Cwmllwyd is a bit of a misnomer; it's really just slightly less unkempt and nearer the house than other parts of the wilderness! 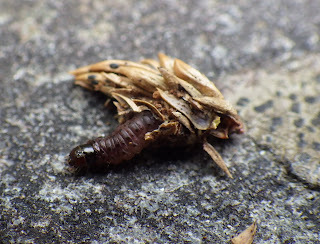 Somewhat surprisingly, however, although it's only about 150 metres from the alder grove it sometimes comes up with a few interesting moths that haven't been trapped there. So, if I choose to trap twice within a couple of days, I always use both sites. And that's what I did last night - Saturday 20 April. Also trapped was the fifth White-marked of the year. A big thank you must go to Ian for all his work for this moth group compiling the newsletter, and all his continued work. Sam for being the county recorder and identifying everything we can't. Here's hoping we all have a great moth-ing year. 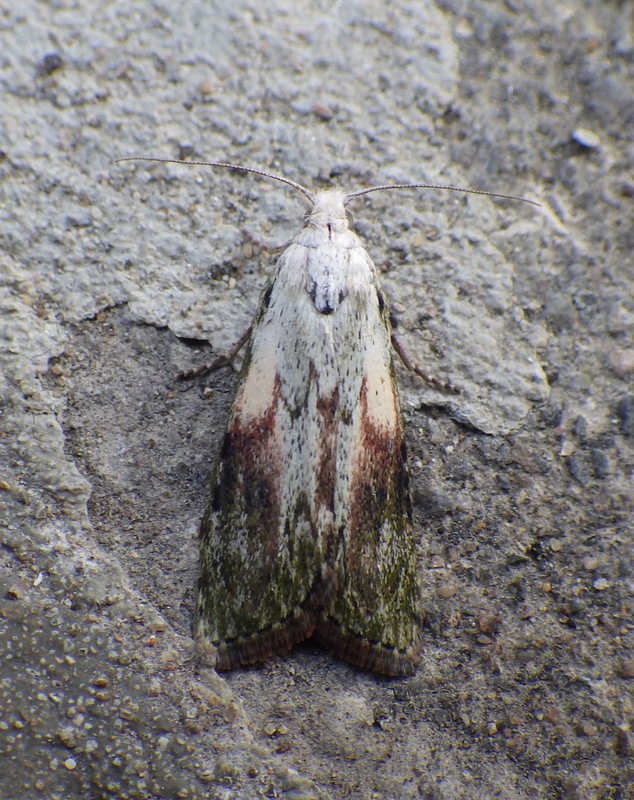 Thanks to Colin Jones for adding the latest (Spring 2019) to the Carmarthenshire Moth Blog (see the R-hand side of the blog page). Gratitude is also due to Sam Bosanquet for writing the general, micro and migrant sections and, as always, for his work as County Moth Recorder. I am sure that all of the moth group would like to thank him. Apologies for the delayed newsletter this year - but life has been busy - and any errors or omissions are my responsibility. Good luck to all in the 2019 season and as Chris Handoll shows below, it`s certainly worth trapping at present. I'm under no illusion that the photos will be sufficient to identify them, but can anyone suggest what the most likely species is? There are fourteen species in our Carms. list, the most frequent being E.argentella, and although the name might seem appropriate for a moth with a grey, metallic sheen, I believe that this species is significantly larger than the ones I'm catching. I suspect that it's one of the Elachistidae. Distinctive markings can be seen with a strong hand lens but my photography is not up to providing a good enough image to show them. 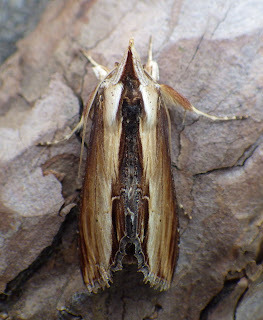 It'll have to go down as Elachista sp.